In 1725, the early workhouse directory, An Account of Several Workhouses..., noted the existence of a workhouse at "Chateris" and "Mershe" [March] . A parliamentary report of 1777 recorded parish workhouses in operation in Chatteris (for up to 35 inmates) and March Hamlet (100 inmates). 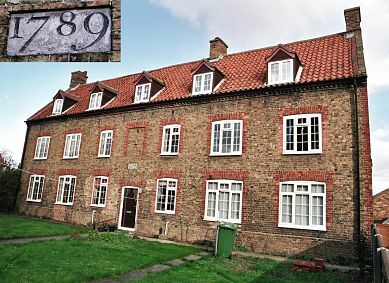 In 1789, Chatteris erected a parish workhouse on Black Horse Lane. The building used bricks made of clay from the Slade and fired locally. Cambridgeshire: Benwick (2), Chatteris (7), Doddington (3), Manea (2), March (7), Welches Dam, Wimblington (3). The population falling within the Union at the 1831 census had been 12,663 — ranging from Welches Dam (population 137) to March (5,117). The average annual poor-rate expenditure for the period 1834-36 had been £6,854 or 10s.10d. per head. 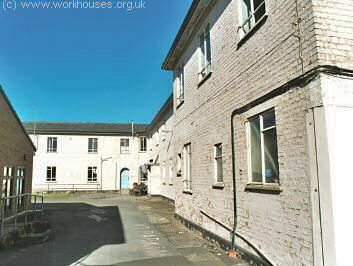 North Witchford Union workhouse was built in 1838 at the north side of Benwick Road to west of Doddington. Its location and layout are shown on the 1901 map below. North Witchford workhouse site, 1901. The workhouse design was based on the popular cruciform or "square" plan. A two-storey entrance block at the south contained a porter's room on the ground floor with the Guardian's board-room above. North Witchford from the south, 2001. North Witchford from the south-east, 2001. To the rear, accommodation wings radiated from a central supervisory hub with males placed at one side and females at the other. A long block at the north may have been the original workhouse infirmary. North Witchford from the east, 2001. 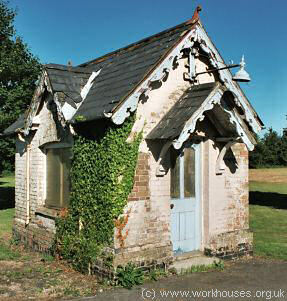 North Witchford gate-lodge from the south-east, 2001. In 1905-6, North Witchford appears to have housed paupers sent from the St John's Road workhouse in Islington. This may have been due to a shortage of space at the Islington establishment and spare capacity at North Witchford for which a suitable charge could be made to the Islington guardians. After 1930 the workhouse became Doddington Infirmary, then from 1948 Doddington County Hospital. The buildings were demolished in June-July 2003. Cambridge Archives and Local Studies, Box SH 1009, Shire Hall, Castle Hill, Cambridge CB3 0AP. Holdings include: Guardians' minutes (1921-30); Inmates' dietary (1836); etc.